Of course, a larger-than-life character like Al Capone didn’t have to wait until after he was dead to see his story unfold on the screen. 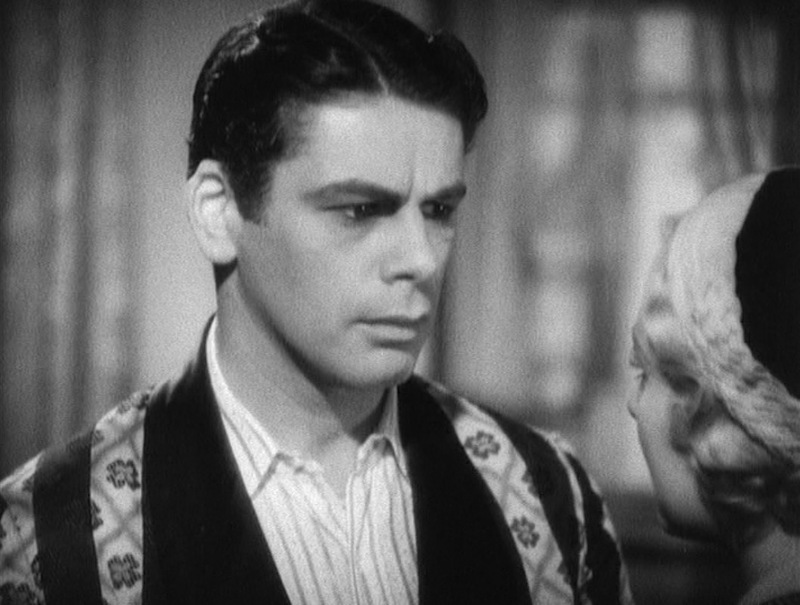 While his name was never used in movies released during his lifetime, Capone provided the obvious inspiration for a number of gangsters in pre-Code crime cinema, most famously the ambitious, smooth, and lethal Tony Camonte, played by Paul Muni in Scarface. The film—or, rather, its 1929 source novel penned by Armitage Trail—even snagged its title from a press-assigned moniker that Capone reportedly hated. Chicago’s underworld in 1924 was a powder keg just waiting for a lit fuse. Capone had risen as a lieutenant to the pragmatic Johnny Torrio in the mostly Italian mob on the city’s South Side, which faced its fiercest competition with the North Side gang, led by Dion O’Banion. By November, Capone grew tired of Deanie the Irishman and sent three hitmen to execute O’Banion in his flower shop, igniting a vicious gang war that all but ended in February 1929 when Capone masterminded the St. Valentine’s Day Massacre, a gangland slaying of seven men that significantly damaged the North Siders but also brought significant heat from police and the press onto the city’s bloody beer wars. Scarface depicts a similar incident to the Dion O’Banion killing; Tony Camonte is fed up that his boss, the cautious Johnny Lovo (Osgood Perkins), is giving too much leeway to their unseen rival O’Hara, who controls his Irish gang from his North Side flower shop. Sound familiar? Camonte sends his right-hand man, Guino Rinaldo (George Raft), to eliminate O’Hara, receiving confirmation of the hit after some telephone hijinks with his dimwitted “seck-a-tary” Angelo (Vince Barnett). Not only will Lovo be furious that Tony is going over his head, but Tony is also going behind his back and stepping out with Lovo’s platinum blonde moll, Poppy (Karen Morley), inviting her up to see his swanky new bachelor pad. Tony: How do you like this place? Poppy: Kinda gaudy, isn’t it? Tony: Ain’t it, though? Glad you like it. Tony Camonte’s silk dressing gown is typical of luxurious loungewear of the era with many still-existing pieces featuring the same details. Unlike the bathrobes designed to function in a more practical capacity as one dried off after a bath or shower, the silk dressing gown was traditionally a status symbol for gents to wear around the house over parts of their day clothing like trousers and shirt, as Tony wears here. The dressing gown is patterned with a field of two-toned four-leaf clovers in a helix-like shadow grid. The whole garment is vertically tiger striped in a dark overlaying color with a low opacity as the pattern can still be seen through them. 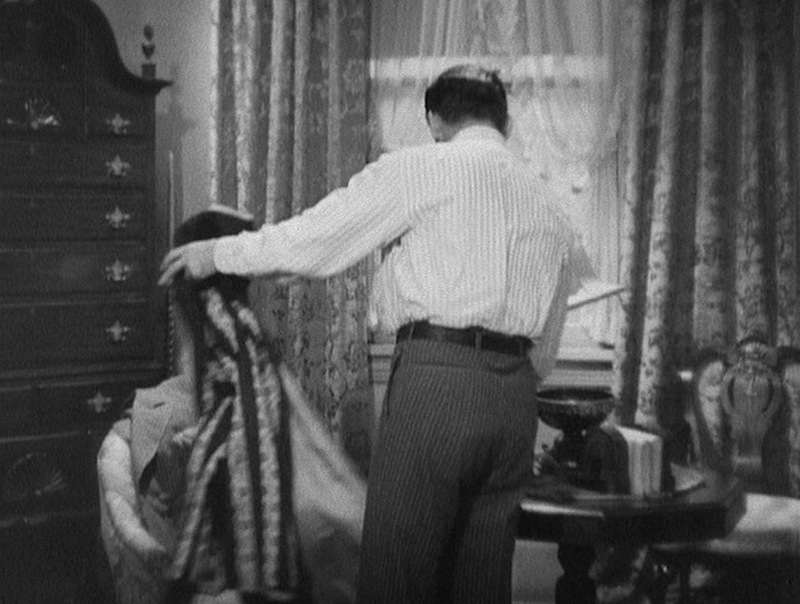 The dressing gown has a solid satin shawl collar with a wide belly, likely in the same color as the stripes (my guess is burgundy, a regal, luxurious color that was often found on these dressing gowns.) The accents on the top of the welted breast pocket and hip pockets as well as the sash and the “turnback” cuffs are all the same dark silk as the shawl lapels. Tony Camonte and Guino Rinaldo: each dressed for the day’s business in their respective manners. 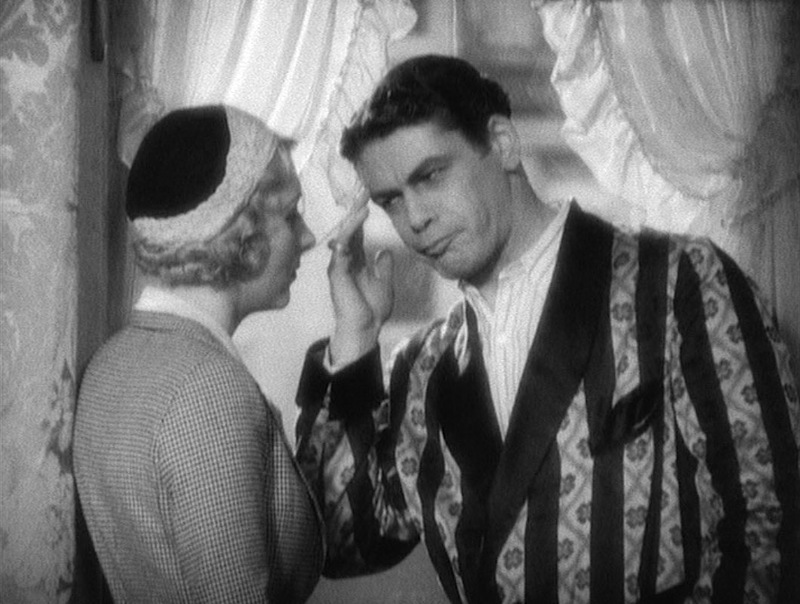 Tony undoubtedly wears dressing gowns like this to attract the attention of women like Poppy, and he can’t hide his delight when she notices the costly silk and feels the material. Poppy: (mocking him) That’s-a purty hot. Expensive, eh? Tony: (laughs) Yeah, come here, I show you some of what’s purty hot. An amused Poppy follows Tony into his bedroom, where his offer to show her “some of what’s purty hot” is surprisingly non-carnal: a stack of his new shirts. Fine shirts were evidently quite a status symbol for gents during the roaring twenties, as Jay Gatsby famously brought his lost love Daisy Buchanan to tears by showering her with his collection of bespoke shirts. Poppy is decidedly less impressed. Tony: Here’s some stuff I buy. Poppy: Mm, aren’t they sweet? Tony: You like? I’m gonna get some ties made to match. See, what I’m gonna do is wear a shirt only once… then I give it right away to the laundry. A new shirt every day. Poppy: Tsk. You’re just gonna drive the women mad, aren’t you? Tony: Yeah… one of them. Tony walks Poppy through his excessively indulgent plan on only wearing shirts once. Tony’s own shirt is uniquely striped with sets of two closely spaced stripes with faint dots striping the white space between them. The stripe is colorized to a light blue-gray in some contemporary lobby cards and promotional artwork. As the same artwork often colors the suit in its correct shade of brown, it’s reasonable to assume that the color of the shirt is also correctly depicted on these materials. The shirt is consistently styled in the fashions of the day with its attached point collar—as attached collars were increasingly common alternatives to the old-fashioned detachable collars—as well as a front placket and button cuffs. When Tony receives word that the police are there to question him in O’Hara’s murder, he promptly ushers Poppy out through a side entrance then dresses to spend his morning at the police station, revealing that his trousers are actually part of a three-piece suit. 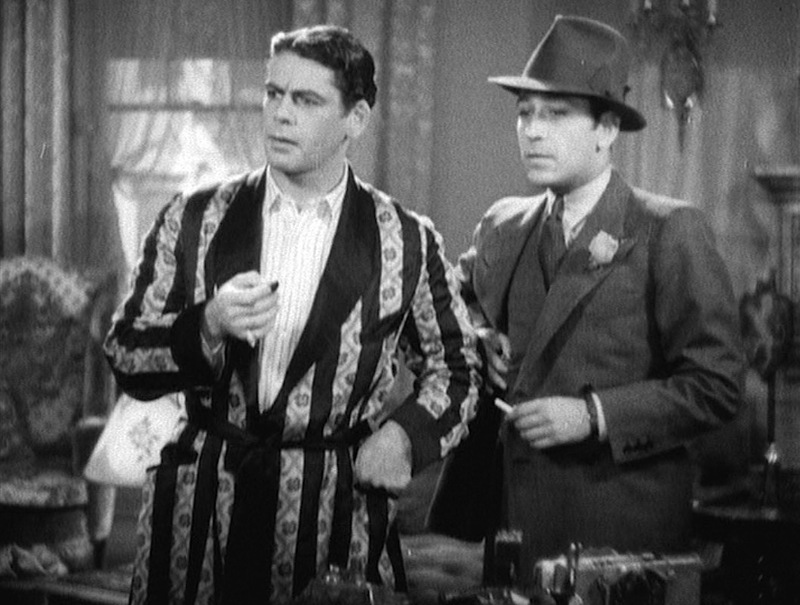 As described by a Profiles in History auction description in September 2015, the chocolate brown wool suit with its “crème-colored pinstripe” was commissioned for Paul Muni by United Artists in the summer of 1931 and made by a tailor shop called Brown & Herman’s. The flat front trousers have straight pockets along the side seams, jetted back pockets, and are finished on the bottoms with turn-ups (cuffs). Tony wears them with a dark leather belt, probably black. Tony removes his dressing gown to don his suit jacket, waistcoat, and tie for a morning of interrogation. Though he wears only the trousers with his robe, Tony grabs the suit’s double-breasted jacket and matching waistcoat as he heads out for the subsequent scene that finds him and Guino meeting up with Poppy in a nearby cafe that gets raked with submachine gun fire. Tony gets his hands on one of his would-be assassins’ Tommy guns and decides to live up to the Cook’s tour motto across the street from his apartment window: “The World Is Yours”. It was while looking out the same window with Poppy that Camonte flashes his pinky ring, a shiner that she had previously dismissed as “kind of effeminate, isn’t it?” though this only prompted Tony to proudly tell her that he purchased it as “a bargain” at an auction. Tony appears to be wearing black calf cap-toe oxfords with spats. From Capone to Soprano, boldly striped robes have long been associated with the image of the gangster at leisure. Al Capone was famously photographed in Miami in 1930, a year after the St. Valentine’s Day Massacre. Based on his laidback demeanor as he smokes a cigar and fishes, you may have never guessed that a strong federal case was being built against him that would find him convicted for tax evasion the following October. Big Al himself, clad in a striped robe while fishing off the Florida coast, circa 1930. 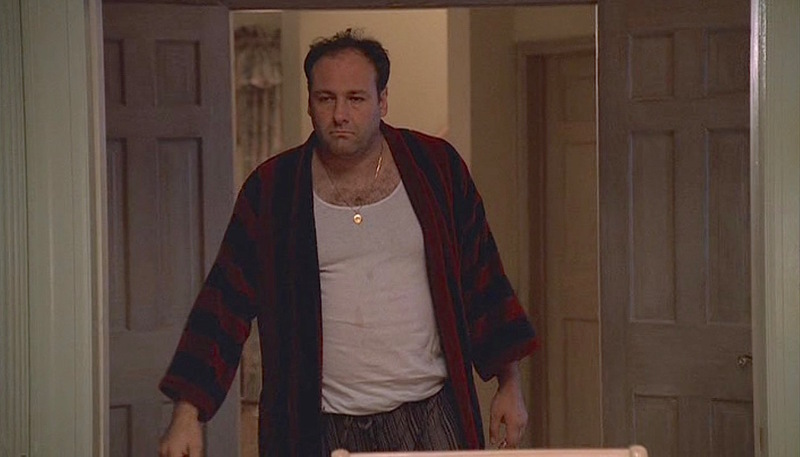 The fictional Tony Soprano (James Gandolfini), on the other hand, reverses the image, wearing his misery as he slumps into his family’s dining room in an open maroon-and-navy striped bathrobe, hair unkempt and teeth not brushed. Wearing a robe more for casual leisure than luxury, a depressed Tony Soprano joins his family for dinner in “Isabella” (Episode 1.12), the penultimate episode of the first season of The Sopranos. Of course, Tony Camonte’s look itself was likely a reflection of the elegant printed silk robe and open-neck shirt that Johnny Lovo wore when the two met on screen for the first time. 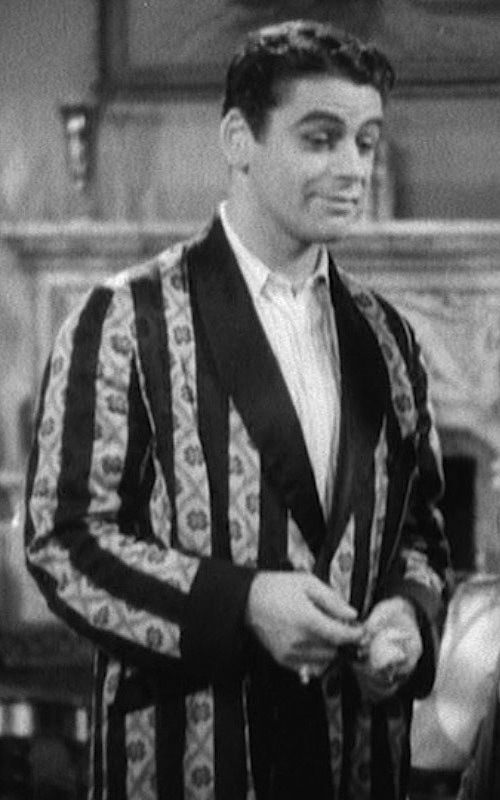 Lovo’s Art Deco-printed dressing gown with its dark satin lapels, sash, and cuffs is much closer to the type of garment Tony would adopt for mornings around his apartment than the less luxurious bathrobes worn by Snorky Capone and Tony Soprano in the above images. At that point in the narrative, Lovo was still someone that Camonte professionally admired and looked up to. For Tony Camonte, Johnny Lovo represented the ultimate figure of aspiration with his luxurious apartment, expensive silk robe, and glamorous girlfriend. Once Tony himself adopts the first two, he assumes the third will fall right into his hands. Now that he’s taken over his aesthetic, his decision-making power, and his girlfriend, Camonte clearly sees himself as the new Lovo, in practice if not name. 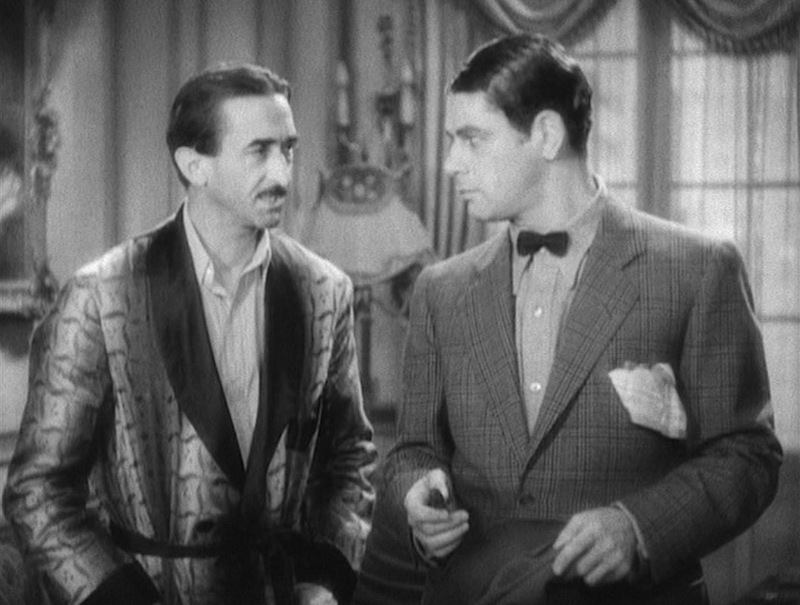 While reflective of his sybaritic taste, Tony Camonte’s printed silk dressing gown also allows him to play the part of the successful gangster even more than the fine suits he wears beyond the walls of his apartment. He carries himself differently when wearing his robe, affecting a strong degree of pride and his own concept of dignity. Check out the movie or the Deluxe Scarface Gift Set which offers both the 1932 and 1983 versions as well as collectible lobby cards and featurettes on both discs. I like Johnny…but I like you more. 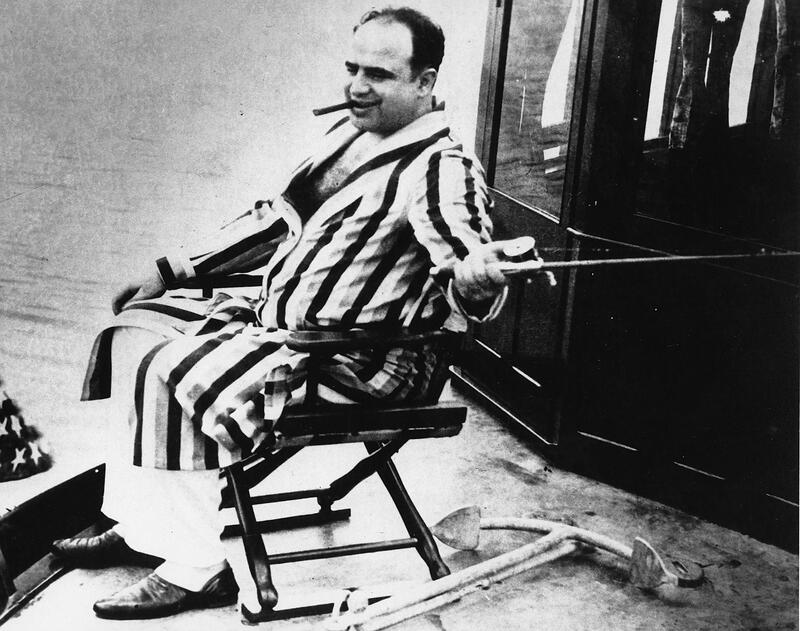 Why is Al Capone holding the fishing…thing with his left hand? Was he left handed?